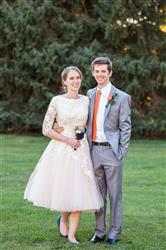 Beautiful retro style tea length wedding dress with ivory lace and champagne lining. Can also be used as a formal dress for special occasions. Can also be customized in another color. I was having a hard time finding a tea length wedding dress that I liked. I found out about ieie Bridal through Etsy. 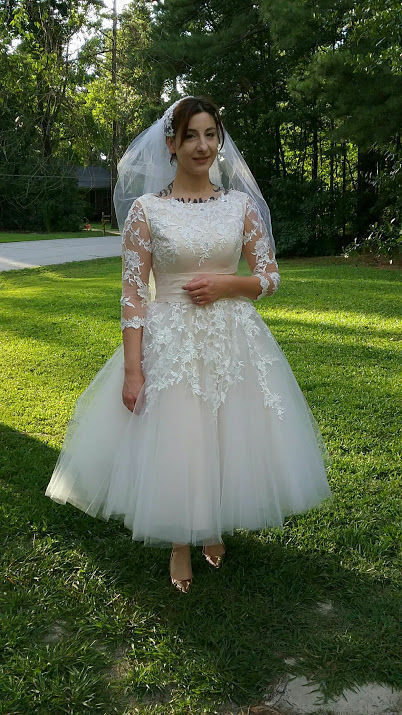 I was very nervous about buying a wedding dress online, but I am happy I did! I ordered a dress customized to my measurements, and it fit perfectly! Only minor alterations were needed before the big day. Very Happy with My Dress! I bought my wedding dress from Ieie. I was nervous to make such an important purchase online, sight unseen, but I couldn't be happier with my dress! It arrived ahead of schedule, was beautifully made, and fit perfectly! My dress came fully lined, with so many petticoats, beautiful lace embroidery, and such great quality! I'd have paid twice what they charged! I ordered this dress in Champagne, and I chose custom measurements since I am on the shorter side and have a short torso and long legs. I was still worried that it wouldn't fit right so I also chose the lace up back so that I would have some forgiveness if it didn't fit right. When I received the dress I realized there was nothing to worry about! It fit like a glove, was high quality, and perfectly resembled the image above. The color was gorgeous, especially in pictures. At my wedding people were constantly telling me how beautiful my dress was, and it has been over a year now and I still have people talking to me about it, and they are so surprised I got it online! I have referred many people to this website and will continue doing so!